anish incentive programmes for solar thermal have become decreasingly generous. Some companies are starting to offer credit lines and alternative schemes to consumers, allowing clients to pay or benefit from solar systems equivalent to their energy saving amount. The business models seem to be successful and may enable solar thermal system suppliers to create a viable non-incentivised market. The photo shows the Pez Espada hotel near Malaga in Andalusia where 60 collectors installed during the former Andalusian incentive scheme, which was halted in June 2015, heat the pool and the domestic hot water. 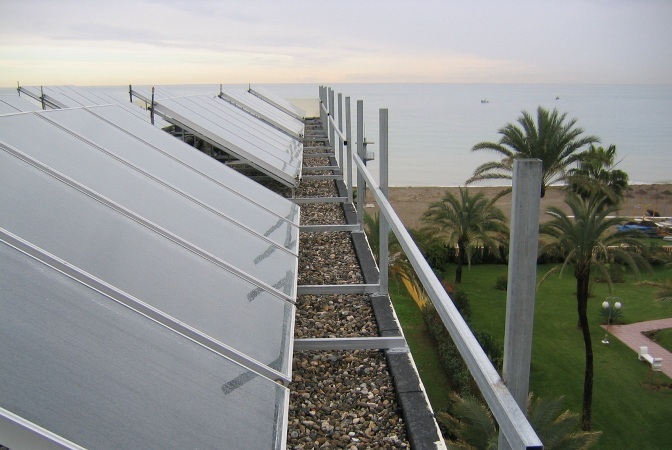 The main drivers behind the small growth of the Spanish solar thermal market over the last three years have been regional incentive programme, such as Prosol or the Programa de Impulso a la Construcción Sostenible (Stimulus Programme for Sustainable Building) in Andalusia. By bringing solar thermal to consumers via direct subsidies, the Andalusian market contributed roughly one-third to the entire newly installed capacity in Spain in 2014. Still, even these incentives have become decreasingly reliable and the approval of such credit lines is always subject to small budgets, tight deadlines and uncertainty. As an example, Pascual Polo, Secretary General of the Spanish solar thermal association, ASIT, names the most recent Programa de Impulso a la Construcción Sostenible. It had a budget of EUR 74 million, which was exhausted during the first hours on the date of approval (12 February 2015). In addition, the last Prosol incentive scheme ended in June 2015 and, although a new approval is expected for March-April 2016, installers have decided to act and reduce their dependence on hardly predictable revenue streams. Some companies have begun to offer innovative financing schemes to prospects. One of them is Novasol, an installer from Andalusia with eight offices across Spain and more than 300 employees. The company has provided its customers with a financing solution that works as follows: Clients who wish to purchase a solar thermal system agree with Novasol on monthly instalments, so they do not have to pay the money upfront. The amount of each instalment is equivalent to the monthly energy bill they used to pay plus a certain discount. After the credit is paid back in usually 6 to 7 years, the client will acquire full ownership of the system and only energy savings remain. Novasol negotiates directly with financial institutions about credit lines (similar to leasing) with better-than-average-market interest rates of around 4 % annually. According to Jose Atanasio Fernández, Technical Director at Novasol, the scheme has become increasingly popular: “Two years ago, maybe 60 % of our systems were paid through financing schemes. Now, it is more than 80 %”. Fernández believes that the recent lack of subsidies and the fossil fuel price drops have affected their sales, but he thinks that such subsidies are becoming decreasingly relevant and the industry is starting to operate under free market conditions. “In 2015, we sold and installed 5,000 systems or 30,000 m2 of collectors – only half of which were subsidised. The percentage of non-subsidised systems is growing. With an average instalment of EUR 50 per month and a typical subsidy payment of EUR 500, the difference between a subsidised and non-subsidised system means shifting from a five-year payback period toward a six-year one. It is not that notable,” he believes. Some other companies like Sumersol have been offering similar approaches. Under the motto, “Solar energy starting at no cost”, Sumersol has been providing clients – mostly hotels and nursing homes – with energy by means of an Energy Service Company (ESCO). Sumersol invests in, installs and maintains a solar thermal system that it owns after signing an 18-year contract with a client. This client does not pay anything in advance, but Sumersol will receive the amount saved on the customer’s energy bill minus a 10 to 20 % discount. The difference to Novasol’s approach is that Sumersol operates and maintains the system throughout the entire contract period. Alejandro Diego Rosell is a freelance journalist and consultant specialised in renewable energies and based in Madrid, Spain.